Reference number for this case: 23-aug-54-Lugrin. Thank you for including this reference number in any correspondence with me regarding this case. 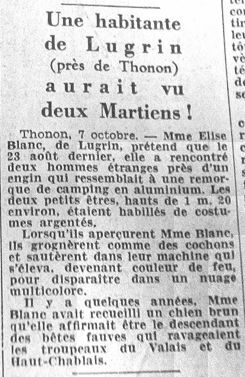 A regional newspaper reports on October 7, 1954, in the midst of many UFO and occupants reports in France, that Elise Blanc, of Lugrin, claims that on August 23, 1954, she met two strange men close to a machine which resembled an aluminum camp-site trailer. She claimed that these two beings were 1 m 20 high approximately and dressed in silver color, and that when they saw her, they grunted like pigs and jumped in their machine which took off while taking a color of fire and disappeared in a multicolored cloud. Elise Blanc had already told a few years before she adopted a brown dog of which she claimed that its ancestors were the wild beasts which devastated the herds of Valais and Haut-Chablais, an important information item given by the newspaper but which was omitted by the ufologists who mentioned the story in their books. No investigation was carried out at the time, the newspaper story being simply included in the ufology literature. In 2006, a local correspondent told me that Elise Blanc actually reported many visits by small beings. Thonon, October 7 -. Mrs. Elise Blanc, of Lugrin, claims that on last August 23, she met two strange men close to a machine which resembled a camp-site trailer of aluminum. The two small beings, tall of 1 m 20 approximately, were equipped in silvery suits. When they saw Mrs. Blanc, they grunted like pigs and jumped in their machine, which rose, taking a fiery color, to disappear in a multicolored cloud. A few years ago, Mrs. Blanc had adopted a brown dog that she claimed to be descendant of the wild beasts which devastated the herds of the Valais and the Haut-Chablais. Jacques Vallée mentions that that there was an observation of type I in Lugrin close to Thonon in Haute-Savoie on August 23, 1954. The authors indicate that on August 23 in Lugrin, near Thonon, France, a man approached a landed object which looked like an aluminum trailer. Two small beings in silvery clothing who grunted like pigs were standing nearby. After the little men entered it, the object glowed red and flew away. 137) August 23, 1954 Lugrin, near Thonon (France). August 23, 1954 Lugrin, near Thonon (France). Elise Blanc approached an object looking like an aluminum trailer with two small beings in silvery dress, grunting like pigs, standing close by. The craft took on a fiery color and flew away (Challenge 129). In Charles Bowen's book, Jacques Vallée indicates that in Lugrin in the department of Haute-Savoie, on August 23, 1954, a man approached an object which looked like an aluminum trailer. Very close, two small beings in silvery clothes grunted like pigs. The craft flew away while taking a fiery red color. Elise Blanc approached an object looking like an aluminum trailer with two small beings in silvery dress, grunting like pigs, standing close by. The craft took on a fiery colour and flew away. "When they saw me, they started to grunt like pigs. They jumped in their apparatus which took off while taking a fiery color, and disappeared in a multicolored cloud." The sources are indicated as being newspaper clipping and their personal file. The authors indicate that in August 1954 Mrs. Blanc observed grunting individuals in Lugrin. The two ufologists and authors indicate that on August 23, 1954 at some unspecified time, in Lugrin, Elise Blanc, in her sixties, saw an object resembling "a small camp-site trailer" of aluminum color and two beings of 1 meters 20 height equipped with costumes of silver plated color, which were standing close to the machine while "grunting like pigs." When these beings saw Elise Blanc, they jumped into their machine which rose while taking a fiery color and disappeared in a "multicolored cloud." The two authors indicate the books by Garreau et Lavier and by Jacques Vallée as sources. The authors indicate that on August 23, 1954 in the Creuse, Mrs. Blanc, about sixty years old, saw two beings "grunting like pigs" who were close to an unknown object resembling a camp-site trailer of aluminum color. When these two beings saw the witness, they reinstated "their funny machine" which then rose while becoming "color of fire." The authors wonder whether it should be thought that this person has a lot of imagination, but that this imagination would curiously recut other ufological testimonies, or if it should be thought that she attended a strange scene "which is not so rare than one wants to often believe it, for the folklore is rich of such visions at the edge of the possible." They indicate that the source is "Face aux ET" by Garreau and Lavier, page 198. Jacques Vallee wrote: "On August 23 a well-documented account of a landing took place near Thonon (on the shore of Lake Geneva)." 201. That may be true but unfortunately the case data was not located in time to include in this edition. 201. Vallee, Jacques and Janine. Challenge to Science, p.150. These authors indicate that on August 23, 1957, in Lugrin, near Thonon, France, a witness saw an object resembling an "aluminum trailer", and near the UFO, small beings in silver clothing, growling like pigs. Elise Blanc approached an object looking like an aluminum trailer with two small beings in silvery dress, grunting like pigs, standing close by. The craft took on a fiery color and flew away. The authors indicate that on August 23, 1954, in Thonon, France, a man approached a landed UFO near which two small creatures were standing. They were dressed in light-colored suits, and they grunted like pigs. Eventually they entered the craft, which glowed brightly and then took off quickly. A man approached a landed UFO near which two small creatures were standing. They were dressed in light-colored suits and grunted like pigs. 1954 - Elise Blanc approached an object that looked like an aluminum trailer in Lugrin, France. Standing close to it were two small beings dressed in silver uniforms. They made grunting sounds like pigs. The object took on a glowing, fiery color and flew away. [Note: the Airstream model of trailer, common for this period, is aluminum in color and somewhat ovoid shaped.] (Sources: Jacques Vallee, Challenge to Science: The UFO Enigma, p. 129; Passport to Magonia, p. 208). Elise Blanc approached an object like an aluminum trailer, with 2 small beings in silvery dress, grunting like pigs, standing close by. The craft took on a fiery color and flew away. Elise Blanc approached an object which appeared to be an aluminum trailer with two small beings in silvery suits and who grunted like pigs, standing at its side. The apparatus took a fiery color and it rose, while moving away. The author indicates that in the case of Lugrin on August 23, 1957, the witness is confronted to two small beings in silvery clothing, who grun like pigs. The authors indicate that on August 23, 1954, in Lugrin, Elise Blanc was intrigued by the presence of a quite curious vehicle, a "kind of aluminum caravan", and was amazed by seeing in front of the machine "two small beings in silvery clothes" who entered their vehicle again when they saw her. The craft "took a fiery color" and flew away. I am 35 years old, I am a resident of ANNEMASSE. I have also lived on three occasions, ufological events, but today I come to give you some elements, quite thin... on the LUGRIN (74) affair. Years went by, and it is quite difficult to find some other information on these events, the rare old people which still live in the village are too old to answer questions, but, I learned in 2002 from an inhabitant, that the "visitors" had given to Miss BLANC, "stones", that she had shown to close relations... according to this person, she would have received many visits of the "small beings" before daring to entrust that, which she always regretted, for the gibes and mockeries did not cease any more thereafter... Miss BLANC always maintained her story until her death. After sending of a cordial letter to the current mayor of LUGRIN, I still did not receive an answer to date... who does not try, does not get anything! Til soon, with all my encouragements for your website! In Lugrin, close to Thonon (France), a man (Elise Blanc?) approaches an object resembling an aluminum trailer; very close, 2 small beings in silvery clothes grunt like pigs. The craft flies away while taking a fire red color. Vallée, J., case #5, "Rapport sur l'analyse de 200 observations documentées faites en 1954"
Godelieve van Overmeire indicates that in the Haute Savoie in Lugrin on August 23, 1954, "a man approached an object which had the look of an aluminum trailer; very close two small beings in silvery clothes grunt like pigs. The apparatus flew away while taking a fire red color." The source is indicated as "Charles BOWEN: 'En quête des humanoïdes' - J'ai Lu 1974, p. 35". Luc Chastan indicates that in the Haute Savoie in Lugrin on August 23, 1954 at an unknown hour, "a woman approached an object which had the look of an aluminum trailer; very close two small beings in silvery clothes grunt like pigs. The apparatus flew away while taking a fire red color." The source is indicated as "En quête des humanoïdes by Bowen Charles ** J'ai lu 1974". And: "Elise Blanc approached an object looking like an aluminum trailer with two small beings in silvery dress, grunting like pigs, standing close by. The craft took on a fiery color and flew away." And: "An unidentifiable object and its occupants were observed at close range." The website indicates that on 23 August 1954 at 12:00 in Lugrin, France, "Unintelligible language (grunting noises). Woman approached object like aluminum trailer. two small beings in silvery dress stood close by. Craft took on fiery color, flew away. Close encounter with an unidentified craft and humanoid occupants." And: "One aluminum rectangular object, about 20 feet across, was observed by one female witness, an experienced observor, in a city (Blanc, E). Two dwarves, each wearing a silver suit, were seen." And: "Elise Blanc approached an object like an aluminum trailer, with 2 small beings in silvery dress, grunting like pigs, standing close by. The craft took on a fiery color and flew away." The sources are indicated as Webb, David, HUMCAT: Catalogue of Humanoid Reports; Lorenzen, Coral E., Flying Saucer Occupants, Signet T3205, New York, 1967; Lorenzen, Coral E., Encounters with UFO Occupants, Berkley Medallion, New York, 1976, ISBN:425-03093-8; FSR, FSR (formerly Flying Saucer Review), FSR, London, 1966; Bowen, Charles, The Humanoids: FSR Special Edition No. 1, FSR, London, 1966; Pereira, Jader U., Les Extra-Terrestres, Phenomenes Spatiaux, Paris, 1974; Vallee, Jacques, Computerized Catalog (N = 3073); Vallee, Jacques, A Century of Landings (N = 923), (in JVallee04), Chicago, 1969; Schoenherr, Luis, Computerized Catalog (N = 3173); Rogerson, Peter, World-Wide Catalog of Type 1 Reports; Delaire, J. Bernard, UFO Register Volume 7 (1976), Data Research, Oxford, 1976; Hatch, Larry, *U* computer database, Author, Redwood City, 2002; Rosales, Albert, Humanoid Sighting Reports Database. Lugrin is a few Klm from Evian, just outside the city, in the direction of Saint-Gingolph, which is the last town before the Swiss border (At the east end of Lake Geneva). I went several times to Lugrin, the old railway route linking Thonon-les-Bains in Switzerland by the shores of Lake Geneva is always visible, but abandoned. Madame Elise Blanc (her married name) had the maiden name: Tupin. At the back of it was the field where she reportedly made her strange encounters, a field that is still used today. The years have passed and it is difficult to find other information on these events, the few elders who still live in the village, remain discreet on this matter! She never changed one word of her story until her death in the seventies (? ), later her house was demoslished. Elise Blanc reportedly has children who would live in the area, but after many phone calls, I could not find her parentage. The testimony of Elise White spread to the United States. In October 1954, the testimony of French people claiming to have seen flying saucers were heard everywhere. ... even in the local Press of the Chablais. Because a resident of Lugrin, Elise Blanc, said he had been confronted also with this phenomenon, beginning in August. Better still, she not only would have seen a UFO, but she would also have stumbled on its occupants! On August 23, 1954, in fact, Elise Blanc reportedly saw a spacecraft that "looked like an aluminum camping trailer" and two humanoid creatures about 1.20 m tall, "dressed in silver suit." Seeing the resident of Lugrin, the aliens reportedly then "grunted like pigs" before joining their ship. Which would have taken a "fiery color," and would go again to where he had come from "in a multicolored cloud." Mrs. Blanc reportedly also admitted making encounter of this type, so that her testimony was taken seriously... by those who probably did not know her enough. "She was called 'the Martian! ', recalls Alain Guiraud, another resident of Lugrin. "We were, well, ten years old, and we went with friends under her window to listen her tell us stories. She was a little crazy..." Because obviously, poor Elise White suffered from too much imagination, like when she claimed to have received a dog that was none other than "a descendent of the wild beasts that once ravaged the flocks of the Valais and Upper Chablais." Today, who can say how much truth there is to this story? Did Elise Blanc tells clumsily about an actual event, or was she suffering of compulsive lying? What is certain, however, is that the UFO specialists have taken (visibly from indirect source) her testimony, compiling it into books about encounters with aliens, and to the United States (where curiously, Ms. Blanc is a man ...). Today, the story mainly makes smile - but not everywhere. "I have the impression that it made more noise outside, where the story was embellished, than in Lugrin, where the things were a bit concealed, Jacques Burnet, the mayor of the town, analyzed. The Lugrinois may have been bothered by this affair. "However," Mr. Burnet adds mischievously "You know, in Lugrin, there are still aliens!" Elsie [sic] Blanc approached an object looking like an aluminum trailer with two small beings, grunting like pigs, standing close by. The object took on a fiery colour and flew away. Vallee case 137, citing Vallee 1967, p.129. *Aug. 23, 1954 - Elise Blanc approached an object that looked like an aluminum trailer in Lugrin, France. Standing close to it were two small beings dressed in silver uniforms. They made grunting sounds like pigs. The object took on a glowing, fiery color and flew away. [Note: the Airstream model of trailer, common for this period, is aluminum in color and somewhat ovoid shaped.] (Sources: Jacques Vallee, Challenge to Science: The UFO Enigma, p. 129; Passport to Magonia, p. 208). The author indicates that there was a close encounter of the third kind on August 23, 1954, at an unknown hour, in Lugrin, in the Haute-Savoie, with as witness Mrs. Elise Blanc, who affirmed to have met two strange men close to a machine which resembled an aluminum camp-site trailer. There were two small beings approximately 1,20 m tall dressed in silver-colored costumes. When they saw Mrs. Blanc, they grunted like pigs and jumped in their machine; which rose while taking a color of fire to disappear in a multicolored cloud. The sources are indicated to be Le Dauphiné Libéré for October 8, 1954; C. Garreau and R. Lavier, Face aux Extra-Terrestres, page 45; Michel Figuet and Jean-Louis Ruchon, OVNI: le premier dossier complet des rencontres rapprochées en France, page 72; Jean Sider, Le dossier 1954 et l'imposture rationaliste, page 164. Elsie [sic] Blanc approached an object looking like an aluminum trailer with two beings, 1.2m tall , standing close by. When they saw her they grunted like pigs and entered the object, which took on a fiery colour and flew away in a multi-coloured cloud. Patrick Goss citing Le Dauphine Libre [sic] 8 October 1954. + personal correspondence. Evaluation - Mrs Blanc also told the newspaper that the dog was a descendent of the wild beasts that once terrorised the district, perhaps a reference to the Beast of Gaudavain [sic]. A local correspondent of Goss [sic] wrote to him in 2006 to says [sic] Mrs B also claimed other visits from small beings, to have been given special stones by them etc. The case occurred according to the witness in August, well before the flying saucer reports flap, but is told rather late by the newspaper, when the flap is at its maximal. This does not appear in the account by Jacques Vallée who does not mention his sources, while he mentions sources of other cases. Jacques Vallée, who published this case, word for word, obviously decided that it was not suitable to report the story of the dog adopted by Mrs. Blanc. However, it is logical to think that if the newspaper indicates this detail which is without direct relationship with the Martians, that can only have been to inform the reader about a witness' tendency to mythomania. This omission, like that of the multicolored cloud, is thus a serious error. The same omissions are in Coral and Jim Lorenzen's book, where in addition the witness has become a man, probably following the translation of Jacques Vallée's summary into English, in which the firstname Elise was omitted, and probably thought to be a male firstname by an English-speaking translator. It was in 2006 that I published the first information that show that Mrs. Blanc was perhaps not a "reliable witness", such as the affair of the adopted dog, and her claims of her many visits by "little men". Then came the claim about the small stones, and information giving reason for thinking that her reputation is indeed far from a credible person's reputation. But since then, whether in books or on the web, nobody considered it useful to provide this information. The truncated original version of Jacques Vallée continues to be copied... Including by authors supposed to be "skeptics". I do not affirm that Mrs. Blanc was inevitably mythomaniac and had inevitably invented everything. I do not know that. But it seems quite likely to me, and after all, there is no corroboration, no other witness, no physical trace, for this story. So, to still conceal these aspects of the case and to still present it as if it were a bona fide "close encounter of the third kind", without the slightest doubt, does not appear honest ufology practice to me. So: probable witness invention, myth maniac. [dl1] Article in the regional newspaper Le Dauphiné Libéré, October 8, 1954. [lo1] "Flying Saucer Occupants", book by Coral and Jim Lorenzen, Signet Books publishers, USA, pp 88-89, 1967. [---] "Challenge to Science", ("Science interdite - Journal 1957-1969"), book by Jacques Vallée, page 129, 1966. [jv3] Summary by Jacques Vallée in "The Humanoids: A Survey of World-Wide Reports of Landings of Unconventional Aerial Objects and their Alleged Occupants", boook by Charles Bowen, Neville Spearman publishers, U-K., 1969. [jv1] "Un Siècle d'Atterrissages", article by Jacques Vallée, in the ufology magazine Lumières Dans la Nuit (LDLN), France, #101, page 8, August 1969. [jv2] "Chronique des Apparitions Extra-Terrestres", French translation of "Passport to Magonia", book by Jacques Vallée, J'Ai Lu publisher, France, page 257, 1972. [jv3] Summary by Jacques Vallée in "En Quête des Humanoïdes" book by Charles Bowen, french translation of "The Humanoids", J'ai Lu publisher, France, page 35, 1974. [pr1] "International Catalogue of Type 1 Reports", catalogue compiled by Peter Rogerson, in the ufology bulletin MUFOB (Merseyside UFO Bulletin), U-K., Volume 6, #3, page 59, 1974. [gl1] "Face aux Extra-Terrestres", book by Charles Garreau and Raymond Lavier, Delarge publisher, J'ai Lu, France, pp 47-48, 1975. [bd1] "The UFO Register", compiled by J. Bernard Delaire, U-K, Volume 7, parts 1 and 2, page 43, 1976. [lo1] "Encounters with UFO Occupants", book by Coral Lorenzen, reprint of "Flying Saucer Occupants", Berkley Medallion publishers, USA, 1976. [jv6] "Les Phénomènes Insolites de l'Espace", book by Jacques and Janine Vallée, Robert Laffont publisher, France, page 122, 1978. [bb1] "La Grande Peur Martienne", book by Gérard Barthel and Jacques Brucker, Nouvelles Editions Rationalistes publisher, Paris, page 85, 1979. [fr1] "OVNI, Premier Dossier Complet des Rencontres Rapprochées en France", book by Michel Figuet and Jean Louis Ruchon, Alain Lefeuvre publisher, France, page 72, 1979. [cc1] "Ephémérides des Années d'Espoir de l'Ufologie - 4", article by Gilbert Cornu and Henri Chaloupek, in the ufology magazine Lumières Dans la Nuit (LDLN), #253-254, page 39, July / August 1985. [mf1] "Catalogue Francat des rencontres rapprochées en France (Listing 800 1982) (2 - Suite)", list compiled by Michel Figuet, in the ufology magazine Lumières Dans La Nuit (LDLN), France, #257-258, page 16, November / December 1985. [lg1] "UFOs: A History - 1954 June-August", monography by Loren Gross, USA, page 88, 1990. [kb1] "Enquête sur les Insaisissables - Tome 1", book by Fabrice Kircher and Dominique Becker, Ramuel publisher, France, page 43, 1998. [re1] "Faces of the Visitors", book by Kevin Randle and Russ Estes, Fireside - Simon & Schuster publishers, USA, page 264, 1997. [ar1] "HUMCAT" (Humanoids Reports Catalog), compiled by Albert Rosales, was on the Web, circa 2003. [gm1] "Catalogo de los Primeros Casos de Humanoides Clasificado por Paises" (Firsthumcat), listing by Luis R. Gonzales Manso, Funcacion Anomalia, Spain, page 11, 2002. [jr1] "B-A BA des Extraterrestres", book by Jean-Paul Ronecker, Pardes publisher, France, page 65, 2002. [bg1] "Les Mystères de la Haute-Savoie", book by Jean-Philippe Buord and Jean-Jacques Gabut, de Borée publisher, page 329, France, 2005. [pg1] Email sent to me, non-anonymous, providing new details, September 9, 2006. [lc1] Base OVNI France, website by Luch Chastan, France, circa 2007, at baseovnifrance.free.fr/listgen.php?typlist=1&page=0&numobs=96. [jg1] "RR3 - Le Dossier des Rencontres du Troisième Type en France", book by Julien Gonzalez, Le Temps Présent publishers, France, page 70, 2014. 1.0 Patrick Gross March 10, 2003 First published. 0.3 Patrick Gross September 14, 2006 Addition of new source [le1]. 0.4 Patrick Gross October 11, 2006 Reattribution of short text in Bowen's book to Jacques Vallée as author [jv3]. In the Summary, No investigation was carried out is changed to No investigation was carried out at the time, the newspaper story being simply included in the ufology literature. In 2006, a local correspondent told me that Elise Blanc actually reported many visits by small beings. 0.4b Patrick Gross February 2, 2007 Addition, [cc1]. 1.0 Patrick Gross October 22, 2009 Conversion from HTML4 to XHTML Strict. First formal version. Additions [jr1], [jb1], [go1], [lc1], [ud1], [ud2]. 1.1 Patrick Gross July 2, 2010 Addition [jv6]. 1.2 Patrick Gross October 19, 2011 Addition [bg1]. 1.3 Patrick Gross September 25, 2014 Addition [ni1]. 1.4 Patrick Gross October 2, 2014 Additions [jv8], [ge1]. 1.5 Patrick Gross October 23, 2014 Addition [ta1]. 1.7 Patrick Gross October 18, 2016 Additions [jg1], [ub1], [ao1], [ys1]. In the Explanations, addition of the paragraphs 4 and 5. 1.8 Patrick Gross November 5, 2016 Additions [lg1]. 1.9 Patrick Gross January 27, 2019 Additions [pr1], [bd1], [mf1], [lh1], [re1], [pr3], [kb1], Summary. This page was last updated on January 27, 2019.